What kind of books do you like? How about movies? Like music genres, people like different types of entertainment in their books and movies. But, one thing most people like is a good ending. Let’s face it, we want good to win, the good guy to win the girl, all the problems solved. You know how you hate it when something is left undone, unsaid, loose ends? All the questions have to be answered, the problems solved. Many of my readers may not remember a radio classic and evening news commentator, Paul Harvey (click his name to hear his 1965 Rest of the Story on America). He was famous for “The Rest Of The Story”. 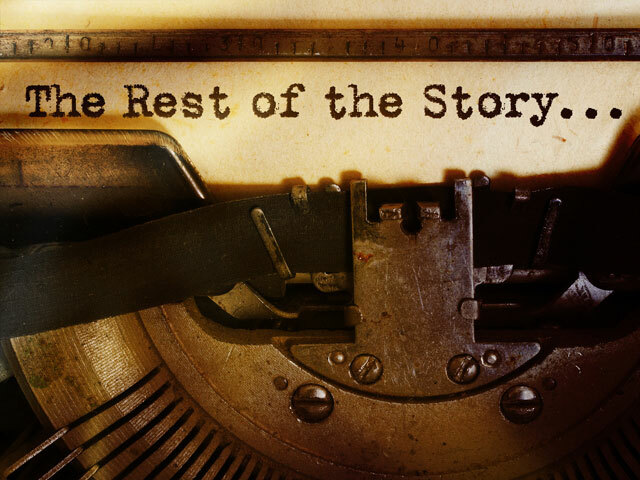 So many times we get ‘blurbs’ of everyday events unaware of what “The Rest Of The Story” was. He told the details with such detail and interest that he kept you hanging on until the end. Sometimes our lives get going so fast that we are constant “blurbs” and nowadays, “bytes”. The rest of the story is lost on those around us. No one knows what our story is and sadly many do not care. Sometimes you feel you’re in a romance novel, sometimes a travel adventure. Often you’re in a mystery and sadly sometimes a tragic melodrama. Our books are written day by day, the story line going who knows where. Characters come and go, tension mounts, tragedy enters or high adventure. Your heart rates goes up and down and you wonder if the roller coaster will ever end. You want the story to end happily ever after like your story books of your childhood. You would be okay with everything no matter what if you could just get a peek at the end, to know that everything turns out all right. Well, you know that if you’re a Christian. You do not have to get impatient with the twist and turns. You may not know the ending but, you know that it ends all right. You KNOW the Author. He’s the Author and the finisher of your faith. Sit back and trust in the end and don’t miss a second of the story worrying about how things are going to turn out or what is going to happen next.